This is my second post today:) Please scroll down to see the new Your Next Stamp Challenge! Hello! A new month means a new day for me to post on the PaperWorks Co. Blog! This month I get to play with the February PaperCard Kit! Did you know that Peggy puts together fabulous Card Kits every month? This month is all about Basic Grey Hopscotch, and you get lots of cardstock, ribbon, brads, dew drops, buttons, and flowers to coordinate with it! So fun!!! You can find the PaperCard Kit HERE! 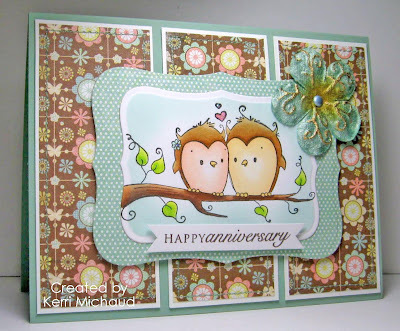 For my card I used this adorable image from the Rachelle Anne Miller Valentine Collection called Whoo Loves You? The thing I love about Valentine's images is that they are so versatile! The sentiment comes from the PTI set Round & Round, and all of the paper, cs, and accessories come from the PaperCard Kit. I'll be back with another card using this fun kit next Wednesday:) Thank you so much for stopping by and enjoy your day! Oh Kerri!! Sweet image and I adore your colors, paper and layout! Darling card! Hi Kerri! Really sweet image, I love the colors and those gorgeous papers too!! Kerri, this card is a real hoot! What a lovely card Kerri, the image is very cute! Awww, this is darling! So soft and pretty...gorgeous coloring, Kerri! What a charming card, Kerri! Love the sentiment banner! Another cutie - love the soft colors on this one and once again your coloring is great! Awww, How sweet are those little owls?!?! Beautiful coloring! !